Agriturismo Metina is a small holding situated in the gently rolling hills of Southern Tuscany. Only a few kilometres away from the historic town of Montepulciano, in the province of Siena, we offer our guests self-catering accommodation, a spacious private swimming pool with entrance slide for ease of use by all our guests, and a family-friendly and dog-friendly garden. In the peace and quiet of this world-renowned wine-making area, you, your family and your pets will enjoy breathtaking landscapes of wheat fields and ancient olive groves, medieval towns full of living history, spas and hot springs, and endless activities. Every season brings different colours for your delight, rendered unforgettable by the flavours and aromas of Tuscany’s cuisine. Our names are Monica and Alberto. We moved to Tuscany two decades ago, and bought Metina. Originally a working farm, Metina still produces olive oil and has extensive vineyards. Over the years, our love for the Tuscan countryside has helped us make our Tuscan agriturismo into what it is today, and we are inviting you to come and share it with us for your holidays, with your family and pets. 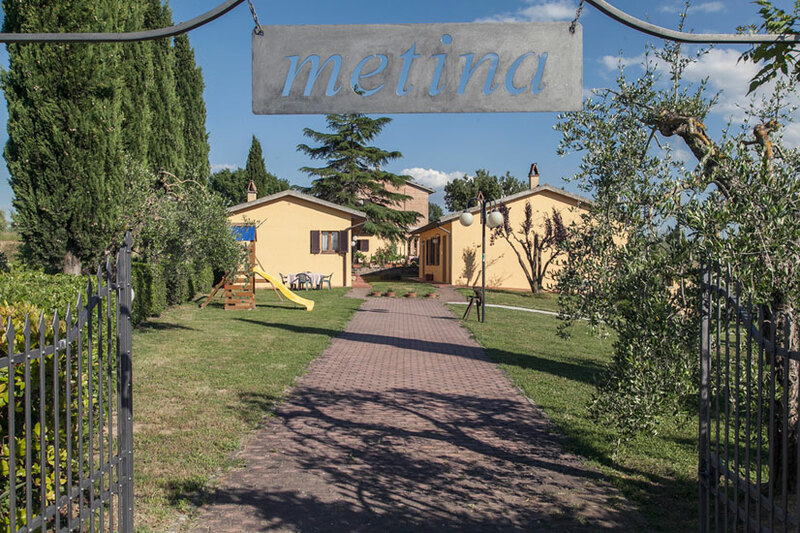 Set in a vast garden, full of aromatic Mediterranean herbs and surrounded by fields and orchards, Agriturismo Metina is safe for both children and dogs. We have five self-catering holiday cottages and apartments, and a private parking area. Our 15×7 metres swimming pool has a depth of 90 to 140cm making it ideal for both younger and not so young users. Moreover, it has a wide entrance ramp so that all our guests can enjoy it, whatever their mobility. Though secluded, it has stunning vistas on the neighbouring valleys and vineyards. Ideal for family holidays – A safe garden with swimming pool and children’s games. Dog-friendly – On a road with virtually no traffic, there are endless walks to be had through the Tuscan countryside. Disabled friendly – Most apartments, as well as the garden, are steps-free, the swimming pool has a wide entrance ramp for wheelchairs, and one of our apartments is set up for people with mobility problems. There are countless activities to be enjoyed … and nothing makes us as happy as helping you find the right ones for you! Bikers friendly – We participate in the annual Wine & Bikers meet up, and can suggest innumerable rides. We will always remember the quiet joy of listening to the pheasants calling in the vineyard as we sipped wine watching the sun go down!